ADEN, YEMEN – Yemen’s Houthi fighters fired missiles at storage tanks at an Aden refinery on Saturday, starting a large fire, and 14 people were killed in clashes between the Houthis and Saudi-led forces near the southern port city, witnesses and residents said. 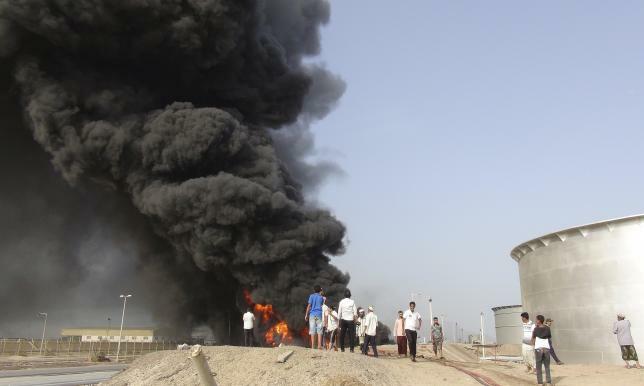 The attack on the refinery in the Buraiqah area sent black smoke billowing into the sky. After months of conflict, Yemen is suffering from severe fuel shortages and its oil and gas industry has all but ground to a halt. Industry sources said in April that the 150,000 barrels per day refinery had shut its operations and declared force majeure on its imports and exports due to the war. In northern Aden, medical sources reported eight civilians were killed, including a woman and her three children, in random shelling by Houthi fighters on residential areas in the al Mansoura and Sheikh Othman districts. An Arab military coalition led by Saudi Arabia has been bombing the Houthis for three months to restore Yemen’s exiled government and fend off what they see as Iranian influence. The Houthis took over the capital Sanaa in September and spread throughout the country in a push they view as a revolution against a corrupt government but deny any military links with their allies in Tehran. Backed up by Arab bombings and weapons drops, local fighters in Yemen’s south and its main city Aden have resisted the heavily armed militia’s advance. Four people from the Yemen’s southern resistance movement and 10 Houthis were killed in clashes early on Saturday near Aden, sources from the resistance movement and residents said. The fighting took place in Ja’wala and Bir Ahmed, north of Aden. So far in the conflict these two areas have been under the control of supporters of Yemeni President Abd-Rabbu Mansour Hadi, who is in exile in Saudi Arabia, and allied fighters. Last week, the United Nations said $1.6 billion was now needed to face a “looming catastrophe” in Yemen.